An enterprising young woman created this poster, first handwritten, then edited and printed neatly, of common phrases that we got from Shakespeare. You always hear how much Shakespeare affected the English language, but it's still astounding to me to see the specifics. 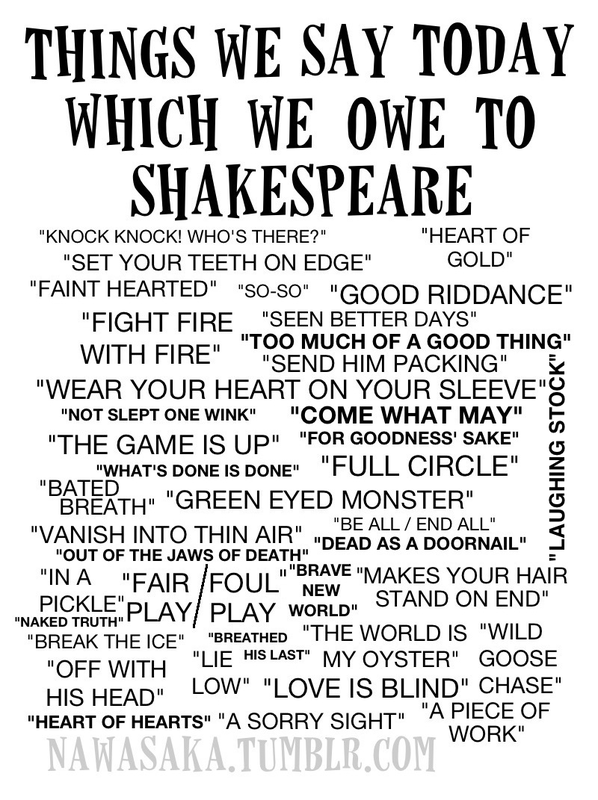 Without Shakespeare, the sentence "Good riddance to the green-eyed monster with a heart of gold who vanished into thin air after a wild good chase!" would just be gibberish! Okay, so it's still gibberish, but really - I use at least one of these phrases weekly. These book dedications made me giggle. I like 2, 6, 19, and 20. Anita Sarkeesian has come out with the next Tropes vs. Women video! In this one, she looks at Women as Background Decoration and, I have to say, it's more disturbing than the previous ones because it deals with video games that literally portray women as objects to be used and abused. Compounding the problem is the widespread belief that, despite all the evidence, exposure to media has no real world impact. While it may be comforting to think that we all have a personal force field protecting us from outside influences, this is simply not the case. Scholars sometimes refer to this type of denial as the 'third person effect', which is the tendency for people to believe they are personally immune to media's effects even if others may be influenced or manipulated. Paradoxically and somewhat ironically, those who most strongly believe that media is just harmless entertainment are also the ones most likely to uncritically internalize harmful media messages. In short, the more you think you cannot be affected, the more likely you are to be affected. This article provides a fascinating - and somewhat depressing - look at the "Strong Female Character" in several recent films. Strong Female Characters who turn into "Superfluous, Flimsy Characters", "Strong Female Characters With Nothing to Do", and "Subservient Trophy Characters" don't really count, after all.